What OS are you using? Windows XP? Vista? 7? If you use a version of Windows recent enough to run Paint.NET, it has a built-in zip utility. Right-click on the zip file and click something like "extract all" (that doesn't say "winzip"). here is a picture to guide you through unzip process. As I do not speak English , my explanation is no good. Thank You dpy, your English is great. There was an old version"Black and Alpha+" in the 5th set pack by mistake. If you get 5th set pack already , please download only new version"Black and Alpha+"
I attached csfile.zip for codeLab .It exist last line of top page. xmario translated my plug in into Russian. Russian people , Please download it in his site. Thank you , xmario . The best I can figure is that the pack only uses the TTF fonts I have, but not the OTF. Is there a fix for this? I know why my plugin can't use OTF . my plugin uses GDI+ . Why I do not use GDI ? 1. I am xp user . (Though I have win7 ,too) I am thinking GDI+ is good for xp user . 2. I do not know whether the C# Text method for GDI is suitable for this effect . But , for PDN4.0 , someday I must rewrite the all plugin's sources . At the time , I will fix it , if possible . Im currently using your speech bubble plugins and I have to say that is totally awesome, but you should add a option that lets you freely move th e bubble's tail, I find it difficult to point the tail to the character that is talking. Have you tried to use the marquee select tool around the tail of the bubble, and then expand it by dragging one of the nubs? I received a email of my plug-in trouble 1 week ago. However, I was not able to confirm the problem. Please tell me , if someone knows the same trouble or method to solve the problem. "The image type is not recognized and cannot be opened." Apparently the "image type" referred to is this F-ing ".dll " format. So, HOW are others successfully (?) adding this to Paint.net ??? I believe that the user is trying to open the .dll file with Paint.NET. Of course the file needs to be copy/pasted into the Effects folder, not opened. And watch his f-ing language! The user is trying to open the *.dll file, and/or has their file associations messed up. Paint.Net should not be used to open *.dll files in that way. 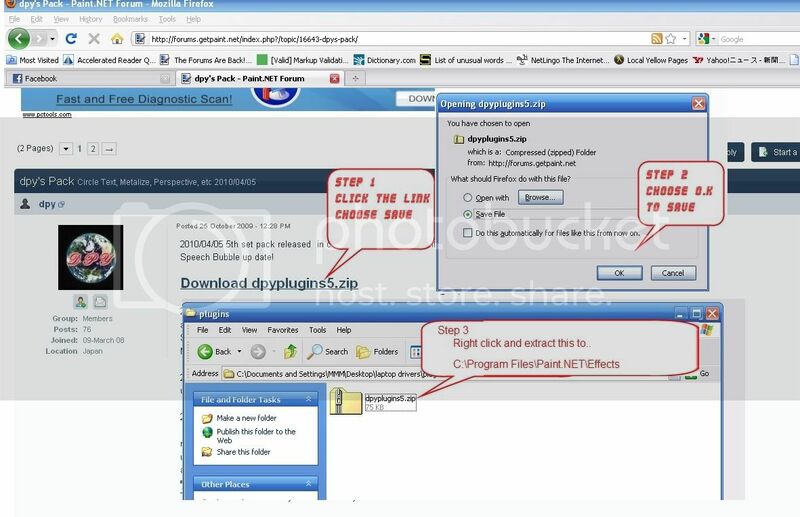 Tell him/her to read the plugin Installation Guide, and simply move the *.dll into the Paint.Net/Effects folder. Note: If someone sent me an email filled with that sort of language I'd be most displeased with them - and let them know it . Edit: Beaten by everyone - serves me right for not checking the latest post! @Martel: Please post in english (rule #22). You are free to PM in any language you prefer, but activity on the forum must be restricted to english. Sounded like the emailler had a sound grasp of english swearing at least . The reason the person who private messaged you is cussing may be because is frustrated with not knowing how to use the plug in. Tell the person to post a help request in paint.Net Forum tell them to post the question in the forum. I was thinking that "Perspective Effect" has bug . Because I can understand English little. It may have been already settled by oneself. But , I tell him it . I have just downloaded this pack but I haven´t been able to use it. I have already unzipped it and pasted the files in the Effects folder but they don´t appear in Paint.NET Programme. Can you please help me? I would really appreciate it. Thanks. Which are you having trouble with? If correctly installed, the text plugins should appear under the Effects > Text Formations submenu. If they don't appear there, or that submenu is not present, try checking for plugin load errors under Utilities > View Plugin Load Errors. Metalize appears under Effects > Photo submenu - but there are more plugins in this pack.